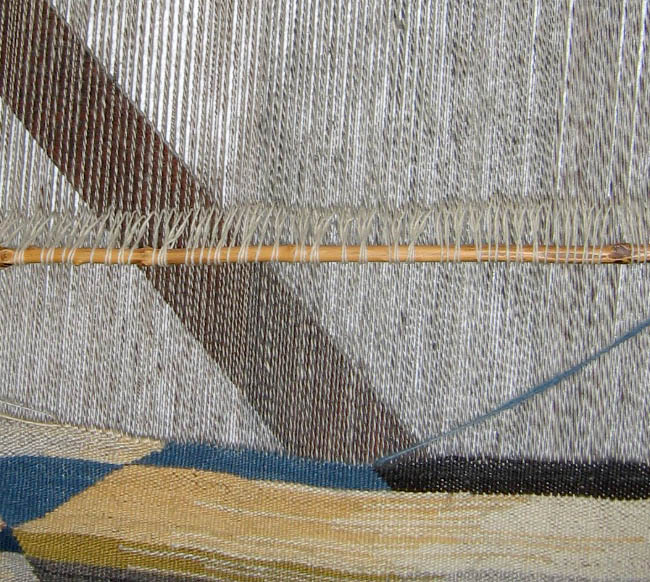 The weft-faced flatwoven technique is one of the two carpet weaving techniques most familiar to the public. 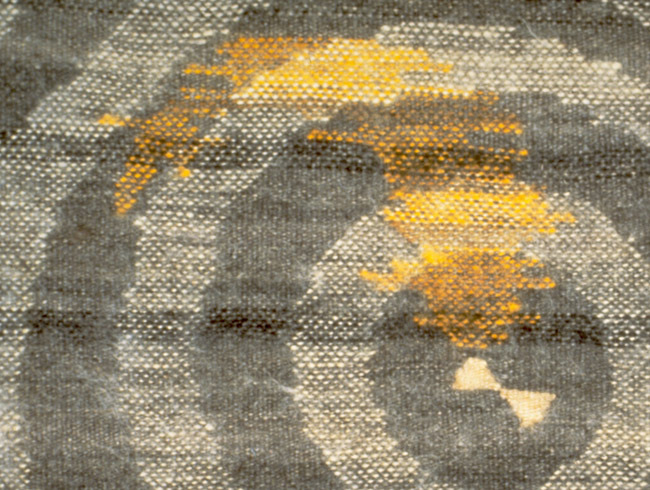 The other familiar technique is the one used to create knotted pile carpets. 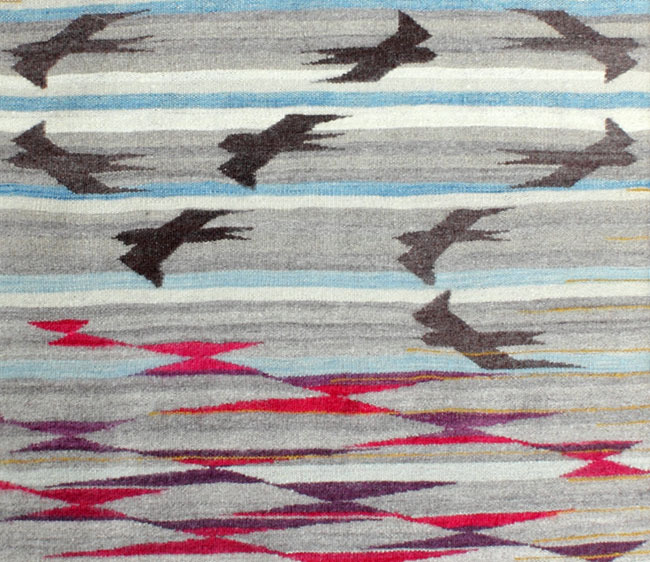 The flatwoven technique is the one used to create Near Eastern kilims, traditional Navaho blankets, etc. These wonderful textiles are all prized for their bold, abstract designs that speak to our contemporary aesthetic sensibilities so strongly. The flatweaving process starts with strong, tightly spun warp yarns stretched under tension, parallel to one another. These warp yarns are the supporting foundation of the work and, except where appearing as fringes at the top and bottom of the woven piece, they will be almost completely covered over by weft yarns after the weaving process is completed. It is the weft yarns that weave back and forth in a direction perpendicular to the stretched warp yarns binding those warp yarns together as in the above image. Weaving the weft yarns in this manner holds the entire piece together, and those weft yarns actually constitute the visible design. One of the most important things to remember in viewing flatweaving is that the structure is the design and the design is the structure. 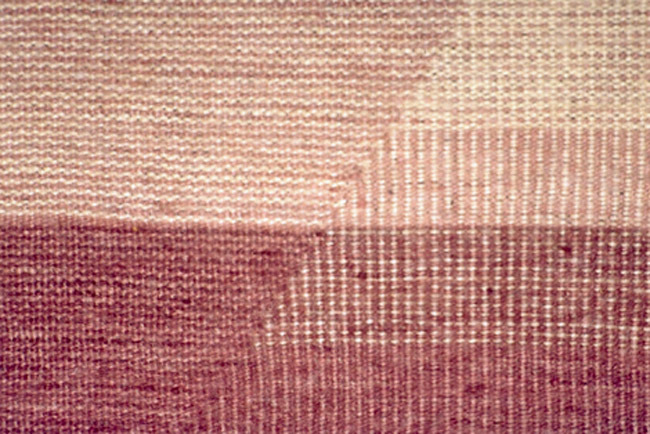 Because the design directly reflects the structure of the weaving, the physical "grain" that this woven technique creates is directly related to the "grain" of the design that appears. For example, the flatwoven structure favors the creation of designs whose borders run parallel with the weft yarns. To create a design element at an angle to the parallel weft yarns is more difficult. To create a design perpendicular to the weft yarns is very difficult. In fact, in kilim carpet weaving design elements perpendicular to the weft cause the characteristic "open slits." Furthermore, the "grain" of the flatwoven technique makes it relatively difficult to create designs with curved lines. Therefore, there are a number of aesthetic elements ingrained in the flatwoven structure. 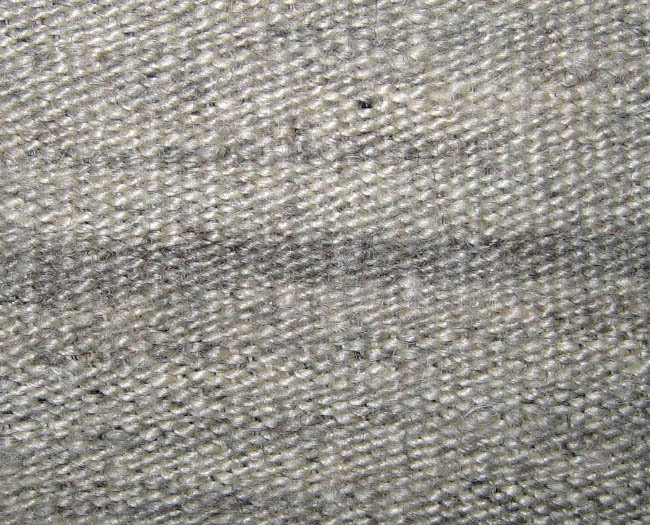 First, as the above image shows, when traditional wools and dyes are used, the primary aesthetic element is "abrash." That is the naturally occurring gentle striping that is so highly prized by collectors of oriental carpets. All hand spun and hand dyed wool yarns have slight variations in how the wools take up the dyes . Even if the weft yarns all seem exactly homogenous in color and shade — which would be quite unusual — different stretches of yarn might be spun more or less tightly than others, which then causes variations in the way in which those weft yarns reflect the light after they are woven into the piece. Therefore, even in woven areas without any design whatsoever, the parallel grain of the flatwoven structure and the nature of the weft yarns and dye process automatically create a subtle striping. The second aesthetic element ingrained in flatweave appears if one purposely changes the weft wool from one color to a different one. 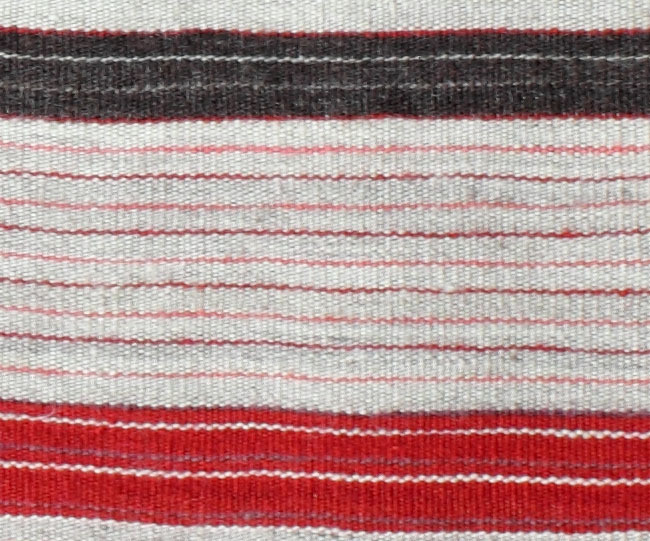 Then stripes are created easily again due to the inherent "grain" of the flatwoven process. If the change of weft yarn color is repeated after every so many rows, that too automatically produces a rhythmic pattern of stripes. A third aesthetic element is the ability to "discontinue" the weft yarn used part way across the row currently being woven and substituting a weft of a different color while weaving back and forth across the warps. 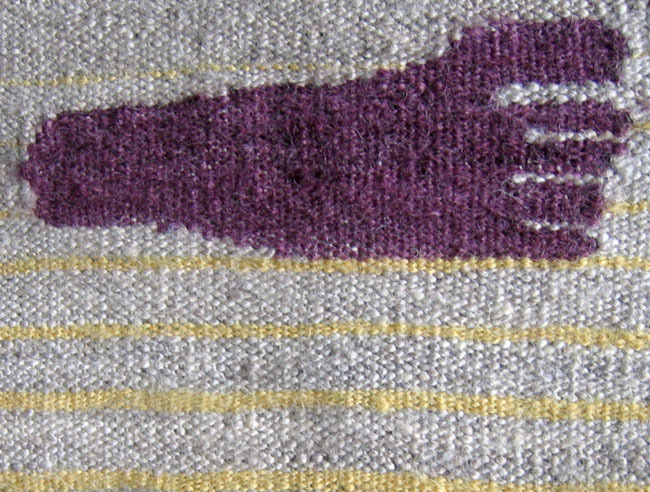 This permits the weaver to go beyond the one dimensional striping inherent in the flatwoven structure to create two dimensional designs like the design of the foot print in the image above..
Because these two dimensional designs are created by passing the weft over and under a specific number of warp yarns, it is relatively easy to replicate these elements elsewhere in the weaving by repeating the same mathematical counts, or to replicate the elements upside down and/or reversed left to right. The more the weaver attempts to make design elements identical, the more visible become the slight variations in the the hand spun and hand dyed weft yarns. And this creates yet another aesthetic dynamic in this tradition between design elements that seem identical at first, but then appear to be different and unique. The confusion between the appearance of being identical yet different breathes still more vitality and vibrancy into these woven design elements. A fourth aesthetic element is the ability when creating a design element not to use the same set of weft yarns for every row. Depending upon the way the different weft yarns are alternated, this can result in the color field created having either horizontal or vertical stripes, or even dotted fields. Alternating like this can even create layers of multiple designs superimposed upon one another as in the above image where the water's surface bears two different disturbance patterns and a gold fish swims below a fallen moth. An awareness of the existence of a "grain" within the flatwoven structure is very important for the fuller enjoyment of viewing and understanding the final piece. The technique traditionally used in creating flatwoven carpets is mechanically the same as that used in the creation of European tapestries. But the two traditions have two entirely different aesthetic approaches that create greatly contrasting art. The European tapestry tradition attempts to overcome the inherent "grain" to create designs with borders in any and all directions and to create shapes as freely as a painter can. The European tapestry tradition strives to mimic painting's subject matter and tends to focus on realistic depictations. In contrast, the ethnic carpet traditions in the Near East exploit the nature of the "grain" and flaunt the way the "grain" tends to make images unrealistic and abstract. And the traditional ethnic weaving traditions revel in designs comprised of patterns using those abstractions. If the ethnic arts of flat weaving can be said to mimic any Western art form, it would not be painting, but Classical music.